The Selected Papers of John Jay are published by the University of Virginia Press. Volume 1 covers Jay’s education and early career, his growing political involvement, and his role in Revolutionary politics, as a member of the Continental Congress, co-author of the first constitution of the state of New York, and president of the Continental Congress. Edited by Elizabeth M. Nuxoll, Mary A. Y. Gallagher, and Jennifer E. Steenshorne. Volume 2 sees Jay emerging as a diplomat, as he sails to Spain with his wife Sarah and their nephew Peter, to negotiate an ill-fated treaty with the Spanish Crown. In Volume 3, Jay joins John Adams and Benjamin Franklin in Paris to as one of the Ministers Plenipoteniary appointed to negotiate the Peace with Great Britain. His pivotal role in this delicate negotiation is explored. Edited by Elizabeth M. Nuxoll, Mary A. Y. Gallagher, Robb K. Haberman, and Jennifer E. Steenshorne. Volume 4 focuses on Jay’s activities as Secretary for Foreign Affairs, founding member of the New York Manumission Society, and co-author of the Federalist Papers. Volume 5 opens with the ratification of the Constitution, and covers Jay’s role in the forming the new government as acting Secretary of State prior to Jefferson’s taking office and as first Chief Justice of the Surpreme Court. Also explored are his gubernatorial campaigns of 1792, the Genet Affair, and the events leading to the negotiation of the Jay Treaty with Great Britain. Volume 6 opens with Jay's negotiation of the "Jay Treaty" with Great Britain and the heated public debate over its ratification. Jay's election as governor of New York in 1795, his role as unofficial advisor to President Washington, and his activities as governor, dealing with Yellow Fever epidemics, refugees, fortifying the port of New York, and the passage of the anti-slavery law are explored. Volume 7 explores Jay's retirement years, when he devoted himself to philanthropic causes, such as the American Bible Society, political discussions with his old friends and sons, and agricultural experiments. The volume consists of correspondence and other writings by Jay and his family, relating primarily to personal affairs and social history throughout his life. Volumes 1-3 of the Digital Edition of The Selected Papers of John Jay were published by the University of Virginia Press in January 2015, as part of their America's Founding Era collection on Rotunda. Subsequent volumes will following, appearing approximately 18 months after print publication. 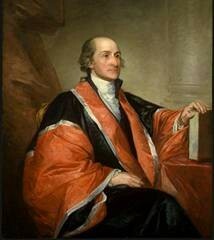 The Jay Papers will join the Papers of George Washington, John Adams and his family, Eliza Lucas Pinckney and her daughter Harriott Pinckney Horry, Alexander Hamilton, James Madison, Dolley Madison, and Thomas Jefferson, as well as the Documentary History of the Ratification of the Constitution and the People of the Founding Era project. The Papers of John Marshall and Andrew Jackson are soon to come as well. Visit Rotunda here.